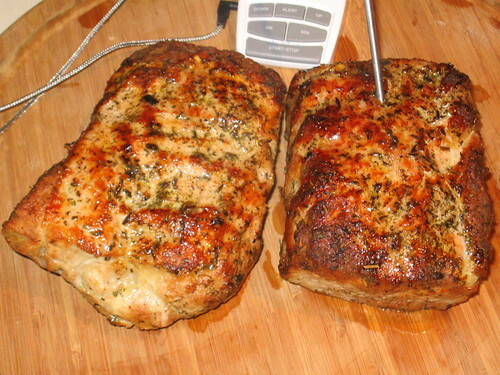 People came over Wednesday night for dinner and I roasted a 5 lb pork loin from Little City Meats. 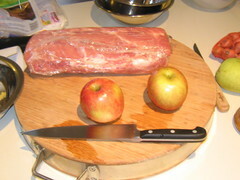 I generally followed the recipe from Julia and Jacques Cooking at Home-- seasoned, browned, then roasted on apples at 375. 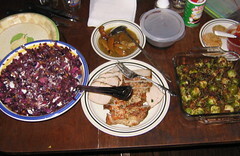 Guests brought sweet potato patties with a spicy sauce, pan roasted brussels sprouts, a red cabbage salad with pine nuts and goat cheese, and an amaretto cake for dessert. I browned the meat in a pan with some shmalz (skimmed from the chicken stock) and a little canola oil. I had to cut the pork loin cut in two since it wouldn't fit in the pan for browning. Having two pieces of meat made it easier to brown the sides-- the tongs held them together.